NLP (Natural Language Processing) is a set of techniques for analyzing and extracting, and understanding meaningful information text. Jurafsky et al., Speech and Language Processing, 2nd Edition, 2008. Manning and Schutze, Foundations of Statistical Natural Language Processing, 1999. 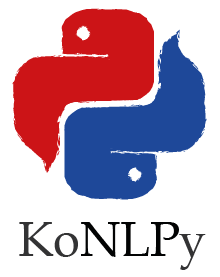 KoNLPy will help you to actually carry out some fundamental NLP tasks with Korean text. In case you’re interested in handling English text, check out NLTK. You have some prerequisites to use KoNLPy. Got ‘em all? Then let’s go. If you’re new to Python, this tutorial should get you through in minutes: http://learnxinyminutes.com/docs/python/. If you’re up to putting in some more time, try The Hitchhiker’s Guide or Learn Python the hard way. Many use Sublime Text 2 for Python programming. Some others use Vim and Terminal. But other than these, there are numerous great text editors and Python IDEs out there, so take your pick!